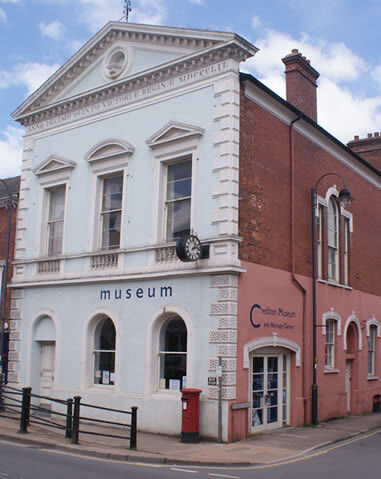 The museum at The Old Town Hall in Crediton High Street began with an exhibition in 2009 to coincide with the 1100th anniversary of the founding of a cathedral in Crediton. Usually open from late April to October (check the Whats On entry for details), the museum attracts over 1,500 visitors a year. It provides a focal point for local people and visitors to learn about the history of Crediton and surrounding villages and to share memories of life in the town. Our exhibitions are usually based on local themes and use the society's archive of documents and photographs. A major attraction is a remarkably accurate model of the High Street immediately before the Great Fire of 1743. Recent additions include objects found during archaeological excavations in the town. In addition to featuring the general history of the area, each year a themed display is included. Research facilities are available for family history along with interactive display units and interpretation boards. We also have a small shop which sells local history publications and old postcards of local scenes. The museum is run by volunteers. No admission charge is made but donations towards our running costs are most welcome! Opening hours: Research Centre: Tuesdays and Wednesdays 10am to 1pm.